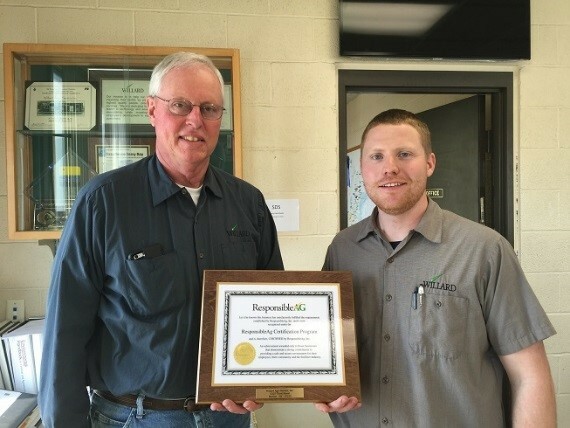 Marion Becomes ResponsibleAg Certified! | Willard Agri-Service of Frederick, Inc.
Several years ago the fertilizer plant explosion in West Texas caused immense damage to the community and loss of life. Since then, the fertilizer industry has come under much more scrutiny. A response to this incident and in an effort to be proactive the fertilizer industry developed a safety certification process called Responsible Ag. This process is to ensure that retail locations are in compliance with OSHA, EPA, DOT and Homeland Security requirements. The Marion plant was selected to be the first location to go through this certification process. First the facility was registered on the Responsible Ag site and then a thorough review of the compliance assessment was completed to determine the required needs to complete the audit process. Next a pre-audit evaluation was completed with our safety consultant; Jeff Phillippi with EHD. Much of his time was spent on compliance documentation issues as well as doing a plant walk through evaluation. Several issues were highlighted in the pre-audit and we had time to take action before the auditor for Responsible Ag actually came and did our scheduled audit on February 3rd of this year. The actual audit was completed and several issues were found that needed to be addressed. The corrective actions were submitted to Responsible Ag and we had a deadline to correct the issues and submit corrective action to the responsible Ag site. Once all of the issues were addressed, we were certified by Responsible Ag as being in compliance. We will need to go through this process again every 3 years to maintain our certification. Currently there are 2,000 Ag retailers that are registered with Responsible Ag, while only 177 of those retailers are certified. That is less than 9% of the registered retailers and now Marion is one of them. The other remaining locations will be scheduled for certifications in the coming months.